Dr. Alidadi delivers high-quality, natural-looking restorations. 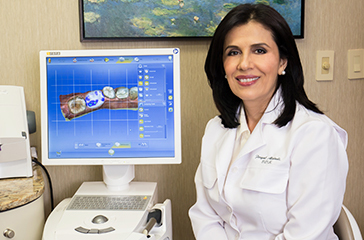 Dr. Feryal Alidadi uses the breakthrough computerized CEREC® (CEramic REConstruction) 3D system to create high-quality, durable, all-porcelain crowns—right in her office. No more temporaries are needed, no more waiting weeks for your permanent restoration to be made at the lab. Dr. Alidadi can provide you with custom, perfectly matched and perfectly fitted dental crowns, inlays and onlays — all in a single visit! Dr. Alidadi has over two decades of experience and has placed hundreds of crowns. She’s completed many continuing education classes in restorative and cosmetic dentistry at some of the top dental learning institutions, including The Pankey Institute and Spear® Education. Dr. Alidadi plans your crown restoration using CEREC’s advanced 3D modeling technology. With the CEREC system, Dr. Alidadi has the ability to custom-design, mill and make any needed adjustments to your crown, while you wait. You and Dr. Alidadi will first go through a color matching process to pick the right shade to match your surrounding teeth. 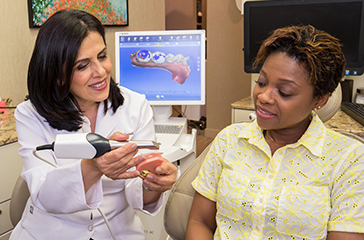 The Omnicam digital scanner lets Dr. Alidadi make a digital impression of your teeth with pinpoint accuracy. The best part is that it’s a virtual impression. There is no more biting down on impression material or putty molds when you need a restorative treatment. 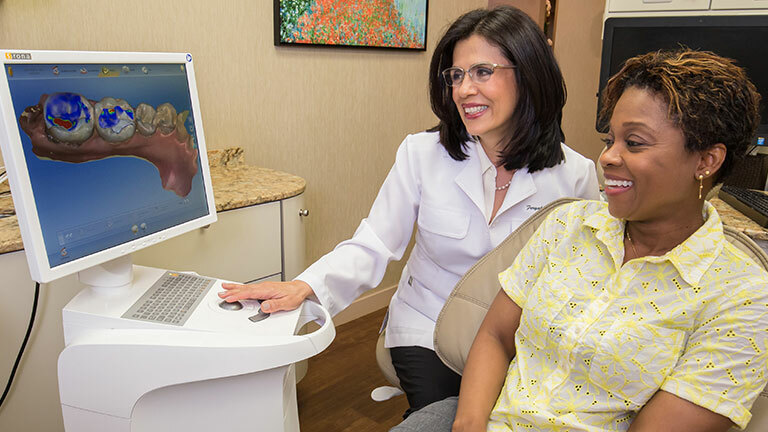 The Omnicam scans precise 3D images of your teeth and gums in their natural color, which are then sent to Dr. Alidadi’s 3D software. 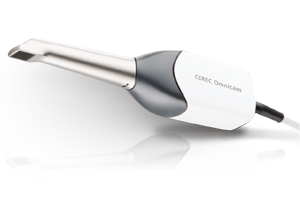 With the 3D images provided by the Omnicam, Dr. Alidadi is able to design your crown on the CEREC system so that the size, shape and biting surface of your new crown are an exact match. The goal is to ensure that your restored tooth looks good and is comfortable to bite and chew with. Using a block of high-quality porcelain, your crown will be custom-milled by Dr. Alidadi to closely match the properties of your natural teeth. When your final crown is ready for placement, Dr. Alidadi can make on-the-spot modifications to your crown’s size, shape and color. Because CEREC is an in-house system, this all takes place right in the office without having to schedule a second appointment. We will explain the process and answer any questions you have. One visit is all it takes. CEREC restorations can be completed in one visit with Dr. Alidadi, eliminating the need for multiple visits to the dentist. Our crowns are strong and durable. 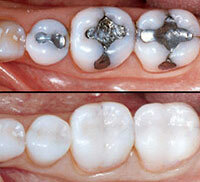 Studies have shown that CEREC porcelain crowns are strong and last as long as metal-filled crowns. The crowns are milled out of a single block of porcelain, so they are less likely to crack or have flaws. Your crown will look natural. The porcelain Dr. Alidadi uses for CEREC restorations has the same translucency as natural teeth. The ceramic blocks come in 17 shades, so color matching is easy and precise. Your new dental crown will look like one of your natural teeth. Your crown will feel natural. CEREC restorations are designed to feel like natural teeth. Dr. Alidadi will polish and shape your crown so it aligns perfectly and feels comfortable in your mouth. Our CEREC crowns are milled out of a single block of biocompatible porcelain. That means there’s no core material, including metal. Onlays and inlays are porcelain restorations that go on or inside the cusps of a tooth to fill a large cavity or damaged tooth. When the damage to the tooth is beyond what a filling can repair, Dr. Alidadi may use an inlay or onlay. This is also a more conservative treatment than using a crown to repair the tooth. When an onlay or inlay is placed, more of the tooth’s natural structure can be saved. Using CEREC technology, Dr. Alidadi can mill high-quality porcelain onlays and inlays in one visit. Dr. Alidadi can replace any low-quality, older crowns made from non-durable materials, or crowns that have already broken down, with strong and natural-looking porcelain ones. She’ll perform a complete exam and evaluate what should be removed and replaced in order to optimize both aesthetics and your oral health. Get a Free Cosmetic Consultation and find out more about fixing a tooth that is decayed or broken down with natural-looking CEREC, one-visit porcelain crowns.